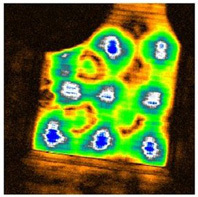 A snapshot of the acoustic motion of a 220 μm×220 μm region containing a 160 μm square bulk acoustic resonator consisting of a slab of silicon of thickness 30 μm. The vibrations are generated by electrical pulses applied to a thin piezoelectric film of aluminium nitride on top of the slab. To animate over a 13 ns interval, click the image (1900 kb movie). Sound in such a thin slab reverberates through the thickness as longitudinal waves or from side to side as surface acoustic waves. Both contribute to the resonances seen. We detect the vibrations with ultrashort optical pulses that are synchonized with the electrical pulses. We can isolate particular frequencies of vibration as shown below. Image for a constant vibration frequency of 1.4 GHz. Surface waves leaking around the device are also visible. To see different frequencies up to 2.2 GHz click the image (1500 kb movie). We can also visualize the dispersion in wave vector space, as shown below. 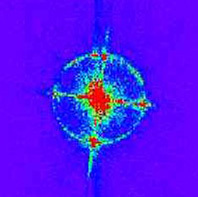 Image of the amplitude at 600 MHz (1 MHz=106 cycles/s) in k space (wave numbers kx and ky range from -2 to 2 μm−1). The circle corresponds to surface waves and the central spot to longtitudinal waves. To see different frequencies up to 2.2 GHz click the image (900 kb movie). 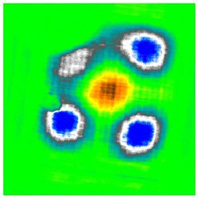 This hybrid technique of electrical generation and optical detection can easily be extended to microscopic resonators of different shapes.